The 300th MultiSwiss 6x16 headed to its new home in Germany recently. A true revolution in the multi-spindle field, this machine has made its mark on the market. Launched in 2011 when multi-spindle technology was still considered extremely complex, the MultiSwiss has definitely found its following. The machine debuted at EMO Hannover 2011 and today it is renowned for its great ergonomics and machining performance. Eight years ago, Tornos decided to take a major technological step by shaking up the codes and choosing to focus on machine ease of use in addition to performance. Designed as a link between multi-spindle and single-spindle lathes, the MultiSwiss 6x16 has six moving spindles using torque motor technology for indexing its barrel. The cycle times of this fast solution rival those of multi-spindle cam machines. Thanks to its hydrostatic technology, the MultiSwiss achieves excellent surface finishes (Ra 0.15) even in difficult-to-machine materials and boasts remarkable tooling. And most importantly, you do not have to be a multi-spindle lath expert to program the MultiSwiss 6x16. It is extremely easy to set up and start and is programmed just like six machines with two linear axes. These characteristics prompted Bubscheim, Germany-based Richard Moser KG Präzisionsdrehteile to invest in the MultiSwiss 6x16. Director Richard Moser was the the first person to acquire a MultiSwiss 6x16 at the EMO Hannover 2011—and it was he who took possession of the 300th MultiSwiss 6x16 produced. The acquisition brings his MultiSwiss 6x16 fleet to an impressive 15 machines. The range of possibilities for the MultiSwiss is surprisingly wide, as proven by the range’s success across Tornos’ focus segments—including automotive—and in markets from Europe to the United States and Asia. The MultiSwiss line—and the range of applications—was expanded in 2016 with the addition of the MultiSwiss 8x26 and MultiSwiss 6x32. It seems that wherever you look—from watches to connectors to automotive components—a vast number of everyday objects are products of MultiSwiss machines. 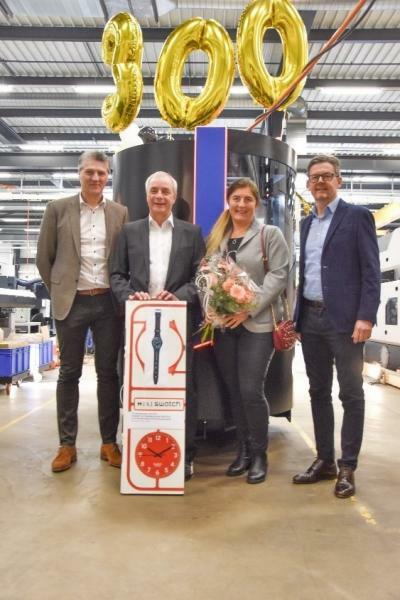 The 300th MultiSwiss 6x16 machine is a testament to both the success of this product range and Tornos’ commitment to innovating according to its manufacturers’ needs, whatever their market segment or application.